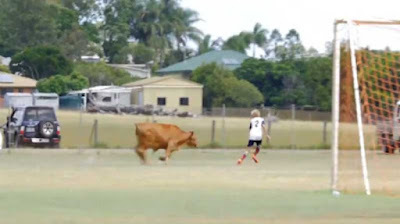 A bull invaded the pich at a junior football in Queensland, Australia, charging the young players and sending them running for cover. 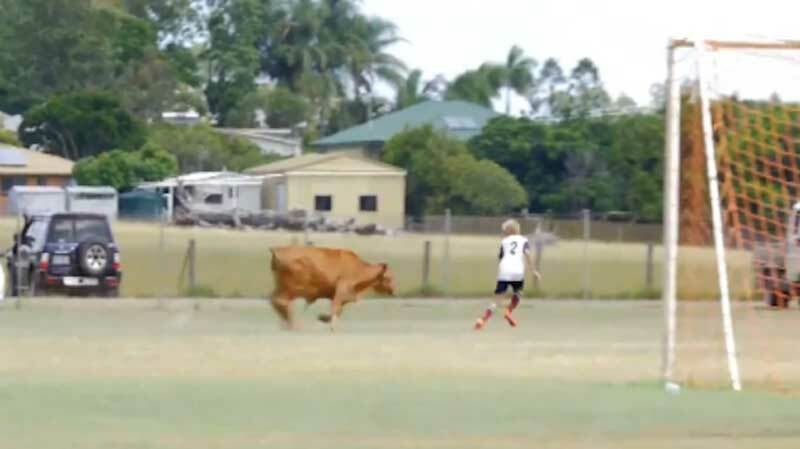 Ryan Devenish was watching his nephew play in Maryborough at the weekend when the bull started charging. Mr Devenish said he first spotted the bull when it emerged from the bush near where he was standing. "It stared at me and actually had a charge at me for about five feet, and then stopped and turned around and went back in the bush," Mr Devenish said. The football pitch at Federation park in Granville is surrounded by paddocks and bushland and it appears the bull found himself on the wrong side of the fence. Mr Devenish said the bull reappeared during the under 15 game. "It was going down the sidelines looking for an opening in the fence so it could get back through," Mr Devenish said. YouTube link. Facebook video link. "I could see it was getting frustrated and I thought 'something is going to happen here'. And sure enough it ran on the field and started chasing that poor young fellow." The young player was able to get out of the path of the bull. Fortunately no players or spectators were hurt during the incident and the bull returned to the bush and was not seen again. Mr Devenish said after the bull had gone away the game continued.